Thin, Thinner, AT200. "Ultra thin and ultra stylish" - Toshiba hasn't got that wrong. At only 7.7 mm the device really is thin. Whether it's everyone's cup of tea or even 'ultra stylish' depends on the user. Just like in life, it's not just what's on the outside that counts, but also what's on the inside!! 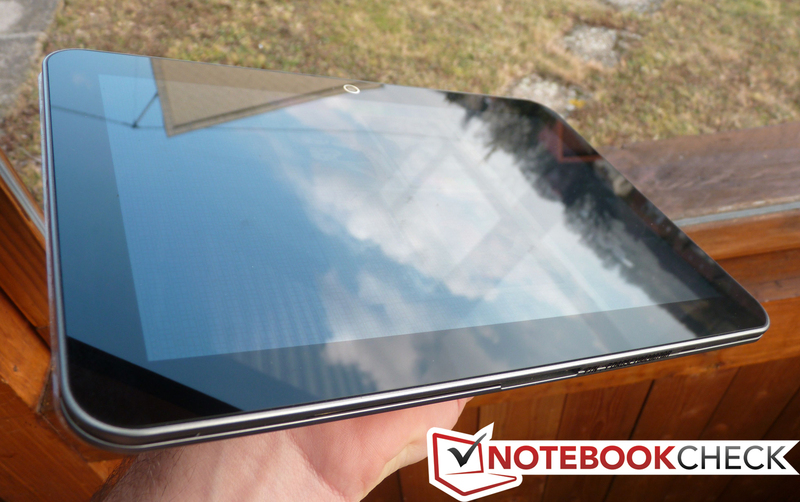 Toshiba AT200: how does the 10.1-inch tablet perform in the review? In the realm of 10.1-inch tablets it's no longer easy to gain a foothold. There are many manufacturers and almost every week there are announcements for more devices. Currently there's a variety of tablets with this display size with Nvidia processors. On the AT200 it's a different story. Just like the Canadian manufacturer RIM (Research In Motion) did with its Blackberry Playbook, Toshiba has opted for processor technology from Texas Instruments. There's also a version of the top-selling Samsung Galaxy S2 with this processor. 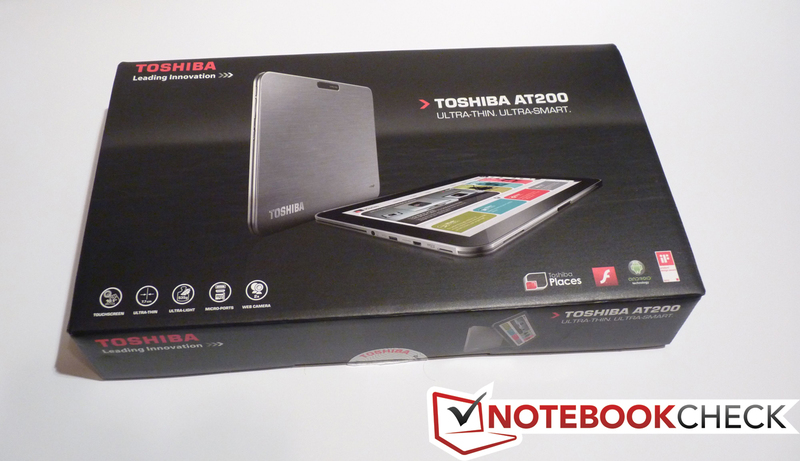 You can find out how the overall package of the "Toshiba AT200-100" really performs in our comprehensive review. 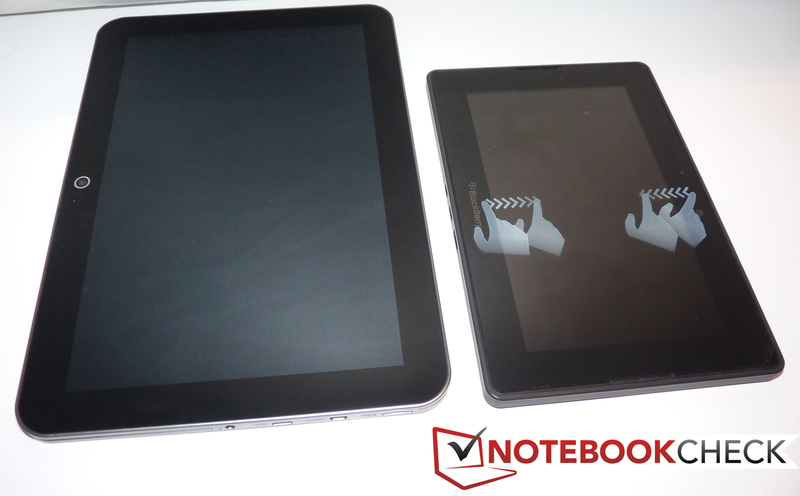 At 535 grams, the Toshiba AT200 is much lighter than, for example, the Motorola Xoom at 730 grams, but still just under 100 grams heavier than the 7-inch Blackberry Playbook from RIM. This weight difference comes down to the choice of materials for the case. The chassis of the AT200 is made from a matte silver brushed metal. When picking up the device for the first time the relatively low weight is noticed straight away. As for its dimensions of 256 mm x 176 mm x 7.7 mm it's apparent that the AT200 is somewhat longer and wider than the Motorola Xoom and the Samsung Galaxy Tab 10.1, for example. In the middle of the silver case border a black plastic rim is incorporated, which extends almost entirely around the device. On the right-hand side there are three recesses in which the hardware keys are tucked away. The 10.1-inch display's edge doesn't project to protect the display; consequently the device completely rests on the display when it's put down face-down. The chassis is made from just one piece of material so one should assume that it's extremely torsionally stiff. However, the very low thickness of just 7.7 millimetres means this isn't completely the case. Unfortunately the AT200 can't hold a candle to the comparatively rigid Blackberry Playbook. In addition our test device has a slightly convex shape, which leads to the tablet not lying completely flush on a flat surface (this reminds us of the first Apple aluminium unibody MacBook...). Just like almost all devices, we don't find any screws or other opening mechanisms on the AT200 to, for instance, swap the battery. 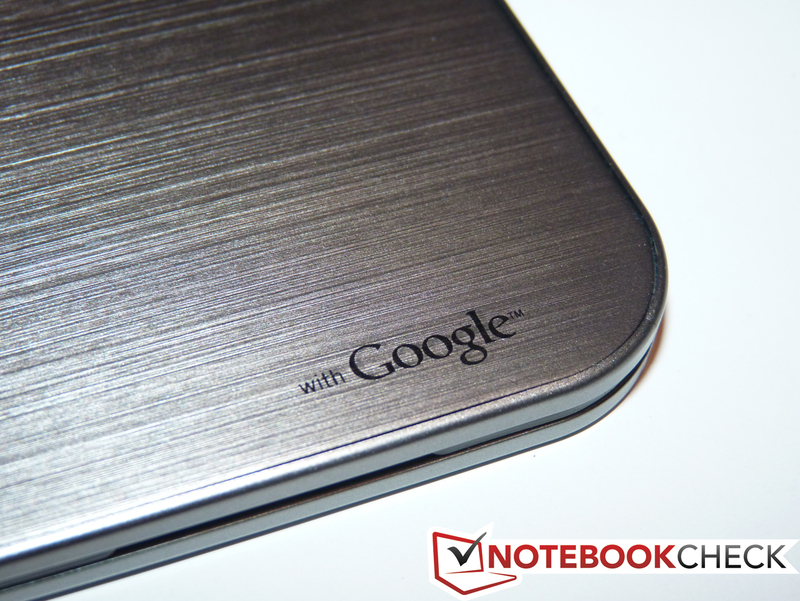 Due to its edges, the device isn't very comfortable to hold, like the Motorola Xoom. In addition the base plate is completely straight and not curved. A curved base plate would be preferable, but would negatively impact upon the thickness of the tablet. Shape-wise the device is comparable to an oversized Apple iPhone 4, and it even has very similar edges. 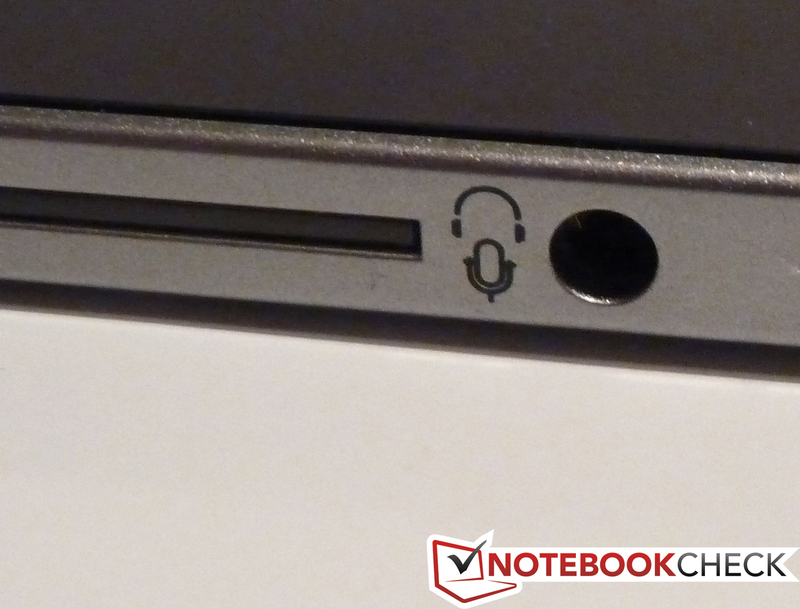 As for the interfaces, the AT200 lines up with a micro-HDMI connection, a micro-USB-2.0 connection, a 3.5 millimetre jack for headphones and microphones and a micro-SD slot. All interfaces are found in horizontal form on the left side of the case. These connections are default on current tablets. 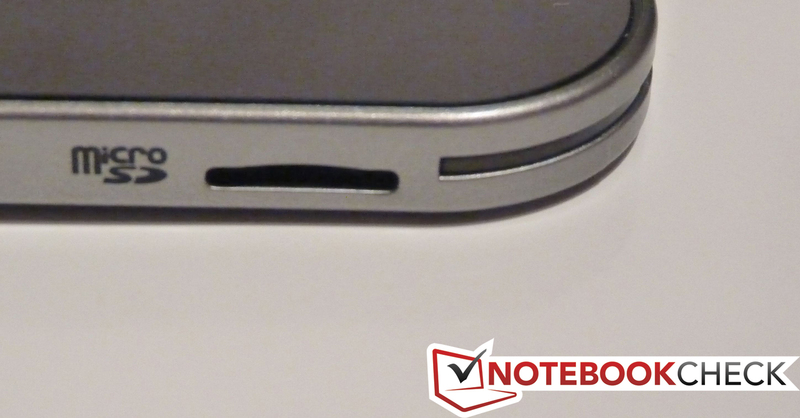 Furthermore there's a dock connector on the underside of the case like those we've come to know on all Apple products. On the AT200 the dock connection is used to charge the device. 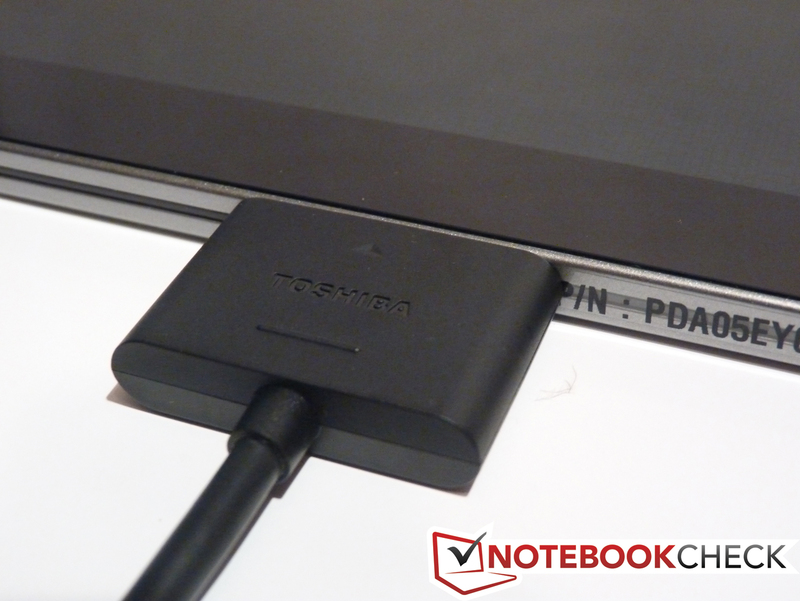 According to the manufacturer's description the tablet can also be connected to a "Toshiba AT200 Dock", yet at the time of the review there's no other information regarding such a dock. The review showed that the tablet can also be charged by the micro-USB slot, yet this depends on what it's plugged into. We tried plugging it into a laptop, yet there was only a short charging signal. Plugged into the socket, the device was eventually charged. Apparently a charging current of 500mA on the USB 2.0 output of the laptop was too low for the tablet. Connecting the tablet to the USB port of a laptop didn't work on Windows 7 64bit or Windows XP, neither was there a relevant driver on the manufacturer's webpage or on the internet at the time of the review. Currently there are two different versions commercially available that only differ in the size of internal memory. In our review we've got the 32GB model (AT200-100). The off-contract RRP according to the manufacturer amounts to a hefty 649 Euro. The 16GB version (AT200-101) has an RRP of 549 Euro. If both amounts of internal memory simply aren't enough, there's the possibility of using a micro-SD card. Micro-SDHC cards up to 32GB are compatible. Regarding the communications modules, Toshiba equips the AT200 with Wi-Fi 802.11 b/g/n, as well as Bluetooth 2.1 + EDR. There's no UMTS module on our model, yet there doesn't currently seem to be any configuration of the AT200 with a UMTS module. There was no further information available of the product specifications on Toshiba's website as to whether the device has a GPS receiver. In the device settings we do, however, find the option to turn a GPS module on and off. The tablet is equipped with two cameras. 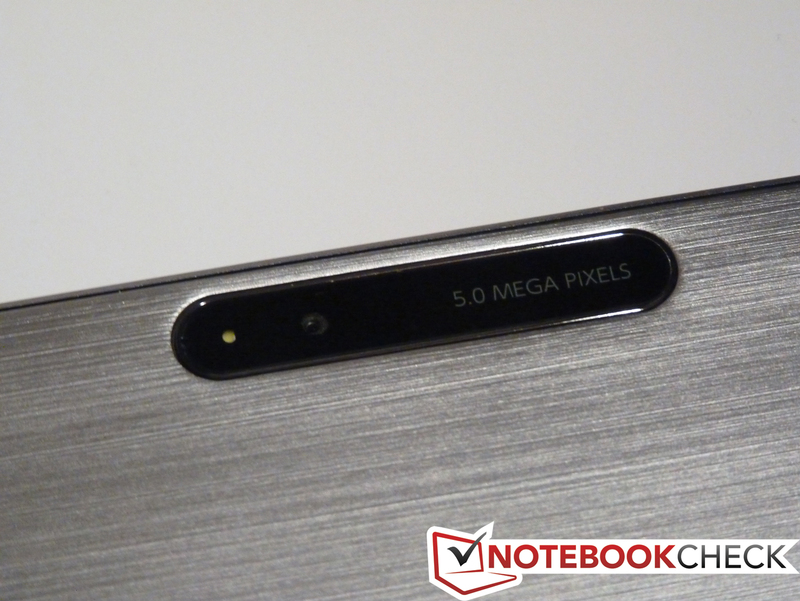 The front-facing camera has a resolution of up to 2 megapixels and mostly serves as a webcam. The main camera is on the rear and has a maximum resolution of 5 megapixels, whilst it can also call upon LED flash in insufficient lighting conditions. 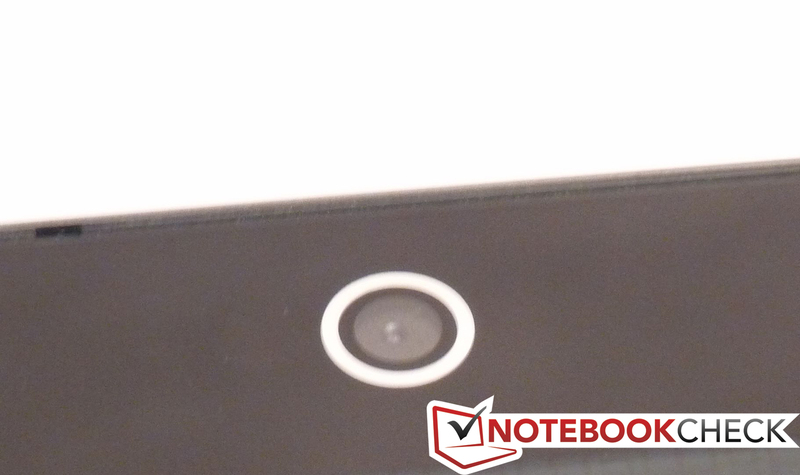 These camera solutions are also found on the Motorola Xoom and the Toshiba AT100. There are no hardware keys for using the camera; everything takes place with help of the touch display. 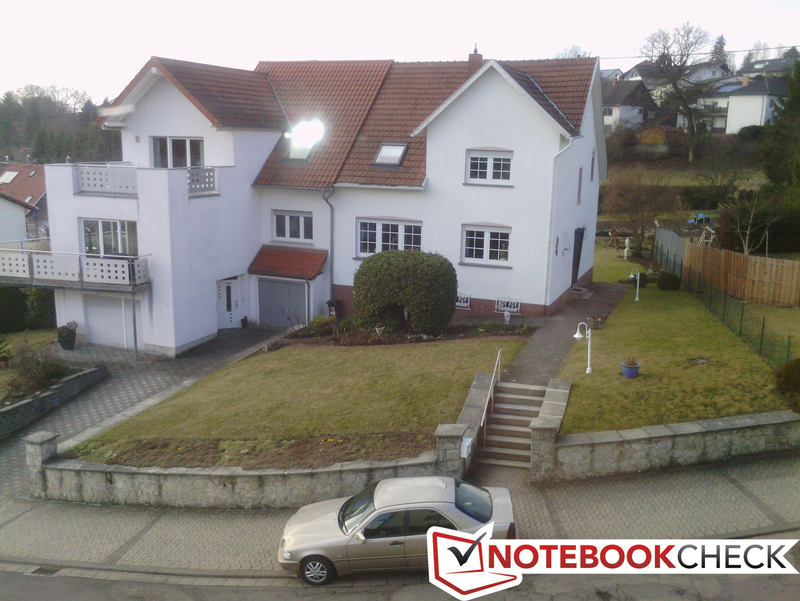 The camera has 8x digital zoom and offers the standard settings of an Android-based tablet. In reasonable ambient light there is image noise for which even the LED flash can't compensate. If images are shot in good lighting conditions the results are not to be sneezed at, yet the tablet's camera shouldn't be preferred over a real camera. The AT200 fulfils its purpose for the occasional snapshot. 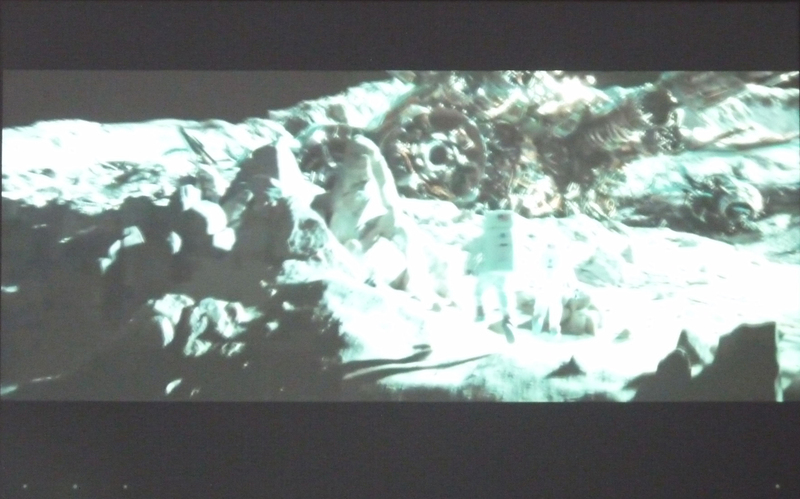 The camera in our test subject, however, doesn't keep up with the camera in the Samsung Galaxy Note. The range of accessories supplied with the AT200 proves to be rather poor. Alongside the 240V charger adaptor there's the docking cable (dock – USB), which can be used in combination with the charger adaptor. 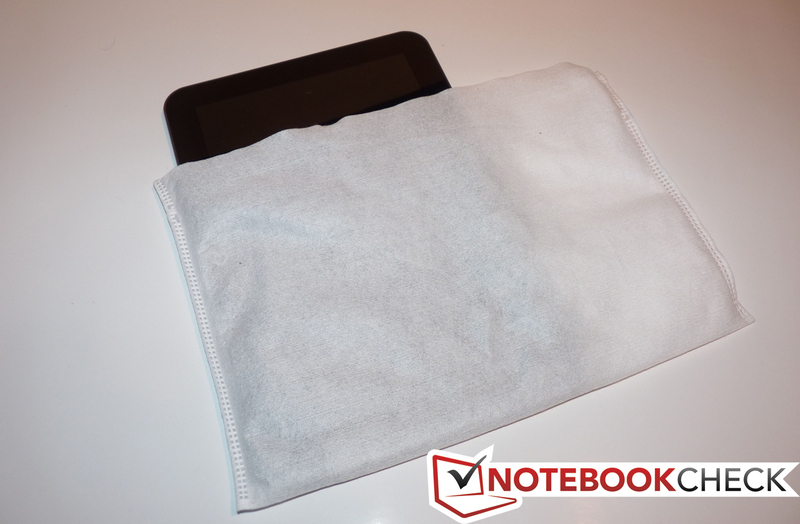 The tablet is supplied in the box in a small fabric bag that protects the device during transit. A full user manual and the most current drivers can be downloaded from the manufacturer's webpage. 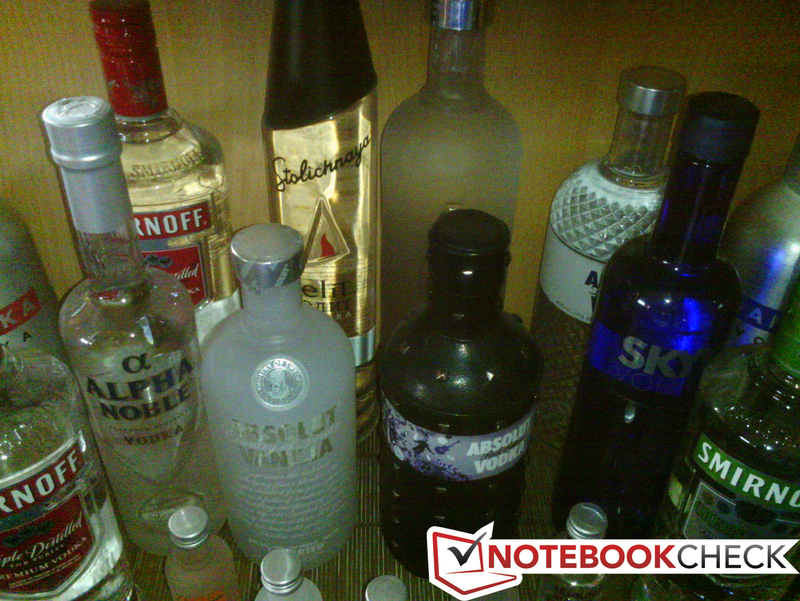 Other accessories can be sourced from well-known online retailers. As we've come to expect from tablets, many cases/sleeves/jackets and screen protectors are sold by third party manufacturers. 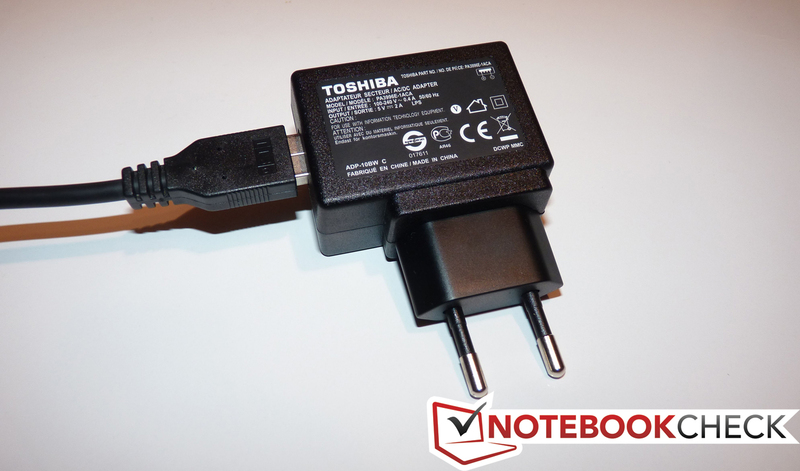 Toshiba supplies the device with a 2 year international bring-in manufacturer warranty for Europe, the Middle East and Africa including on-site pick-up service in Germany and Austria via contacting the Toshiba Notebook hot-line. As is usual for tablets, operating the device is almost exclusively carried out via the 10.1-inch touchscreen. 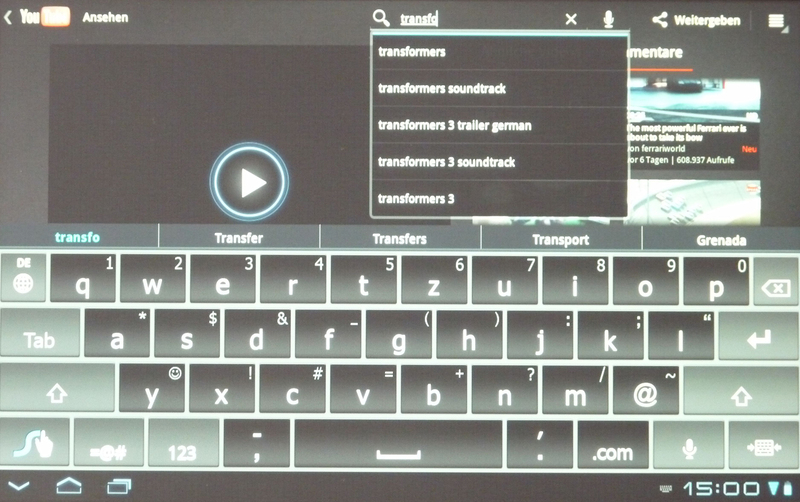 The virtual keyboard almost takes up half of the display in horizontal mode and depending on use it's quite hard to reach the keys in the middle of the display. You should be better off resorting to other keyboard apps from the market. In vertical module this problem disappears and you can type short texts very well. The display reacts nicely and takes care of input very well. There are no manufacturer-specific quirks in the size of the keys on the touchscreen. Everything stays "same old" and behaves just like other Honeycomb 3.2 Android tablets. On the right side towards the top of the case there's the power button. Immediately below it there's the volume rocker and a multi-function slider. 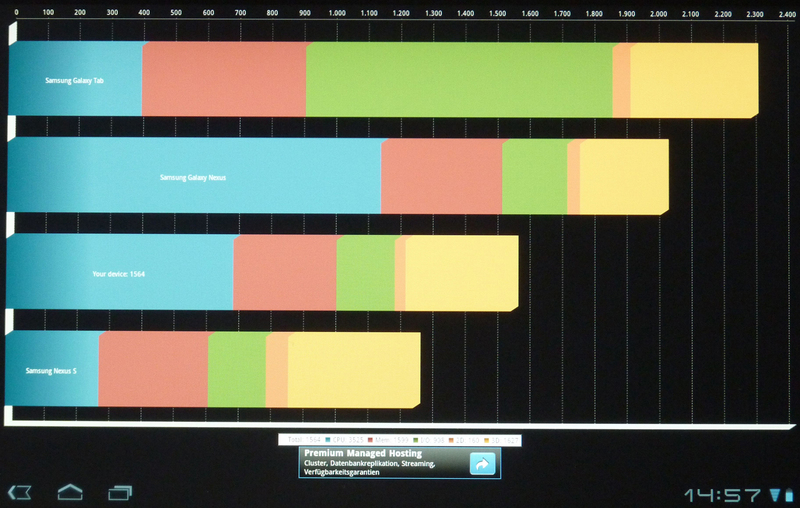 This slider takes care of two different tasks that you can change according to your preference in the system settings. On the one hand it's possible to lock the display and on the other hand you can put the device in silent mode, just like on Apple's iPhone. The Toshiba AT200 has the usual sensors like a brightness sensor, tilt sensor and an accelerometer. These can be used in games or to automatically dim the display brightness and aren't considered anything out of the ordinary on devices of this kind. In our test subject there's a 10.1-inch capacitive display with Gorilla Glass technology. 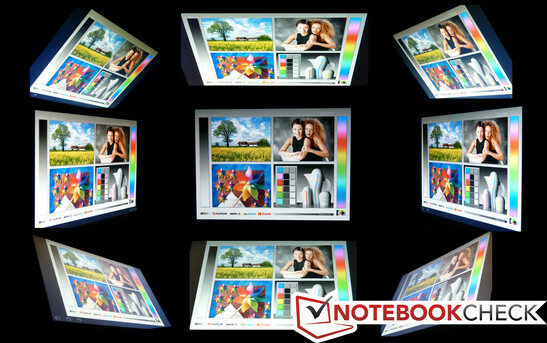 The display is made by Toshiba and goes by the name: TruBrite WXGA Multi-Touch TFT high-brightness display. According to manufacturer's claims the display should also have good viewing angle stability. The aspect ratio amounts to 16:10 and the display is illuminated by LED back-lights. It has IPS technology (In-Plane-Switching) and has a resolution of 1280 x 800 pixels. Due to these two factors the pixel density is 149ppi. This combination of display size and resolution is currently still the standard and can therefore be found on many models (Motorola Xoom, Samsung Galaxy Tab 10.1, Asus Transformer Prime TF201, Huawei Mediapad (7 Zoll)). 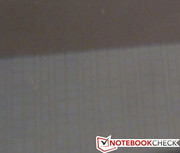 However, the Samsung Galaxy Note, previously reviewed by notebookcheck.net, has this resolution but on a 5.3-inch display. The AT200, like almost all of its colleagues, has a reflective display. According to our measurements with Gossen Mavo Monitor a maximum brightness of 333 cd/m² is reached in the centre of the display. Towards the edges the brightness falls down to, at most, 305 cd/m², which suggests a relatively uniformly illuminated display. The average display brightness on our Toshiba tablet adds up to 314.6 cd/m². The Apple iPad2 is way out in front with a maximum brightness of (396 cd/m²), as well as an average display brightness of (368.7 cd/m²). 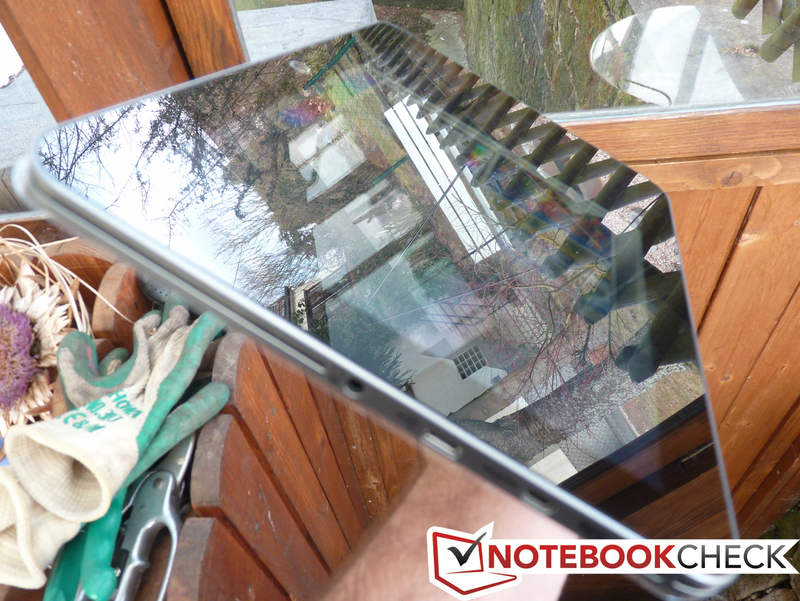 The Asus Eee Pad Transformer TF101 comes very close to our test candidate with an average brightness of 331.6 cd/m². The black level of the display adds up to 0.39 cd/m² and, when compared with the Asus Transformer Prime TF201 (0.28 cd/m²), is a lot worse. 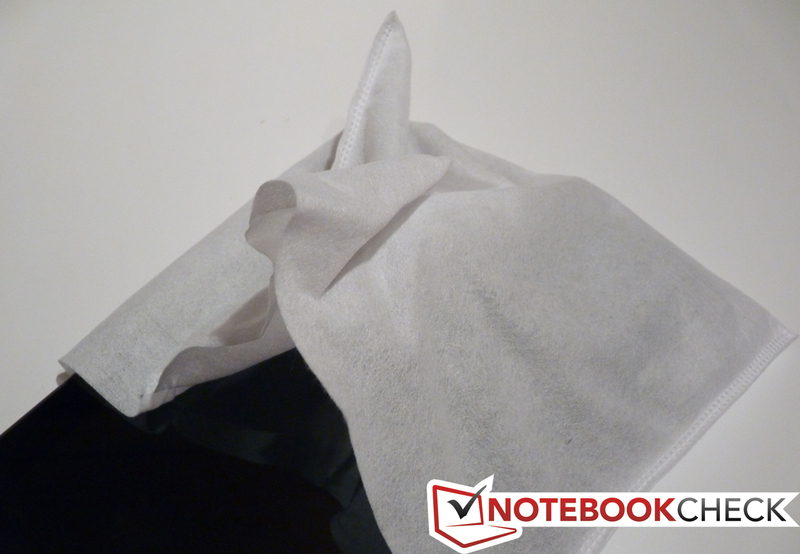 In direct comparison to both of the excellent displays in the Asus Transformer Prime TF201 and the RIM Blackberry Playbook our test subject performs worse in almost all areas. Despite the fact that the AT200 isn't equipped with such a good display as both of its rivals, one can still work reasonably well outdoors on the tablet. The display brightness values of most tablets are head and shoulders ahead of the broad spectrum of notebook displays. The viewing angles are as good as we expected for the IPS display, meaning only slight colour distortion can be seen, even at very large viewing angles. The processor and the graphics aren't provided by Nvidia, which is otherwise often the case. The processor is an ARM dual-core CORTEX A9 OMAP 4430 with a clock speed of 1.2 GHz and an L2 cache of one megabyte. As for the graphics, there's a POWERVR SGX540 with up to 256 megabytes of video memory. The graphics and the platform (OMAP 4430) are manufactured by Texas Instruments and are also used in smartphones (LG P920 Optimus 3D) and in the RIM Blackberry Playbook. Like the Asus Transformer Prime TF201 and the Motorola Xoom, there's 1 gigabyte of RAM with LP-DDR2 memory and a clock speed of 400 MHz. The aforementioned hardware components leave us speculating that the Toshiba AT200 will perform rather well in the benchmarks, like other 10.1-inch devices. 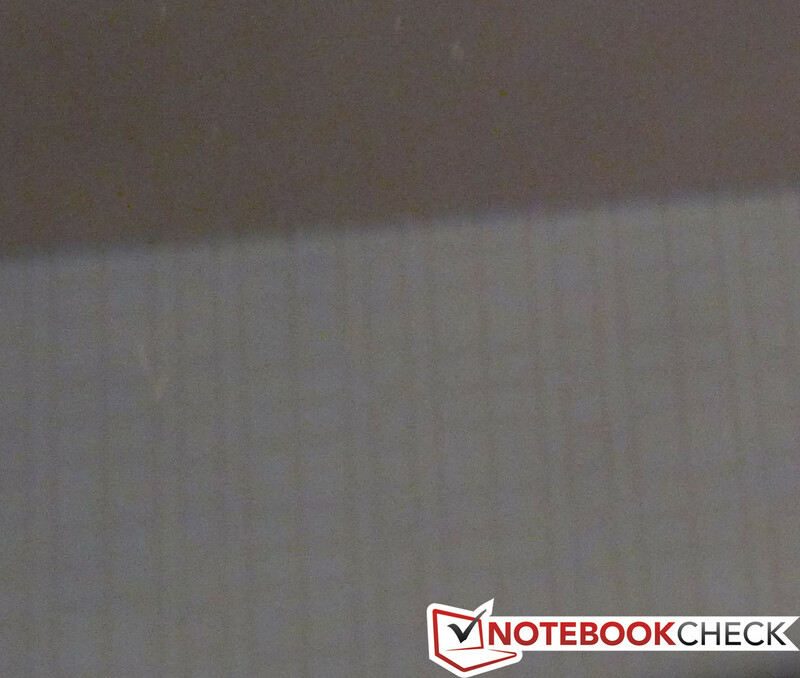 We tested the tablet with some benchmark apps from the Android Market. 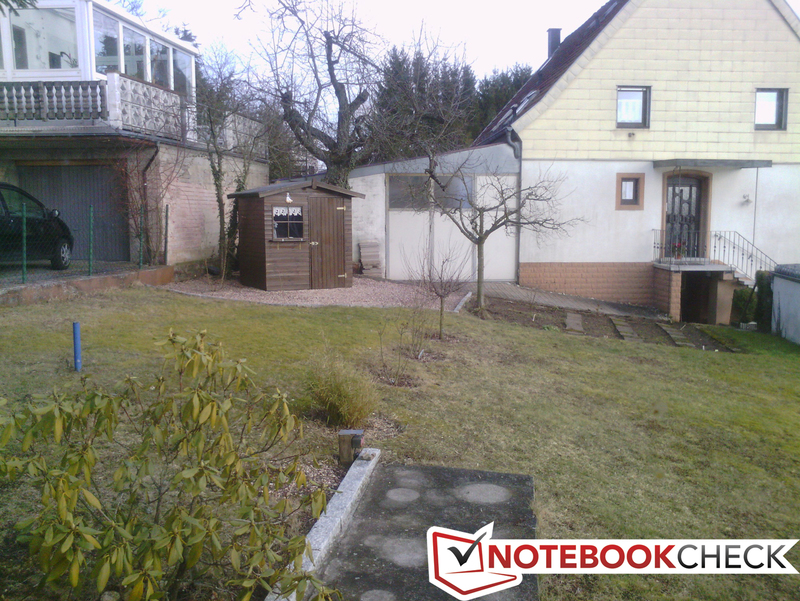 The first benchmark was carried out with the app "Smartbench 2011". This performance test checks the overall performance, so the interaction of all components in the tablet. The result is shown in the following graph. 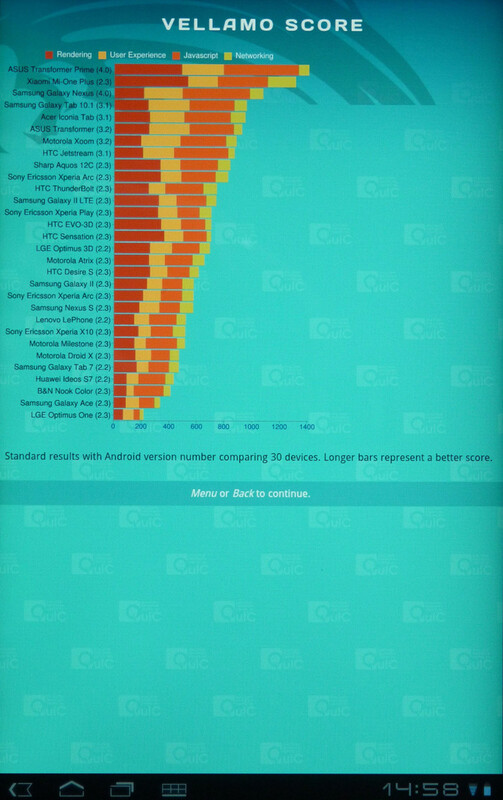 In the app "CF Bench" the test device scored 5116 points, which is behind the Samsung Galaxy S2 (6442 points, ARM A9 with Exynos 4210) and the Samsung Galaxy Note (7224 points, ARM A9 with Exynos 4210) . The benchmark "Vellamo Score" combines many individual benchmarks and especially tests the rendering of internet content. Our AT200 scored 979 points in the test and thus is slightly ahead of the Samsung Galaxy Note (960 points), the Samsung Galaxy Tab 10.1 (950 points, ARM A9 with Nvidia Tegra 2), the Asus Eee Pad Transformer TF101 (920 points, ARM A9 with Nvidia Tegra 2) and the Motorola Xoom (900 points, ARM A9 with Nvidia Tegra 2). 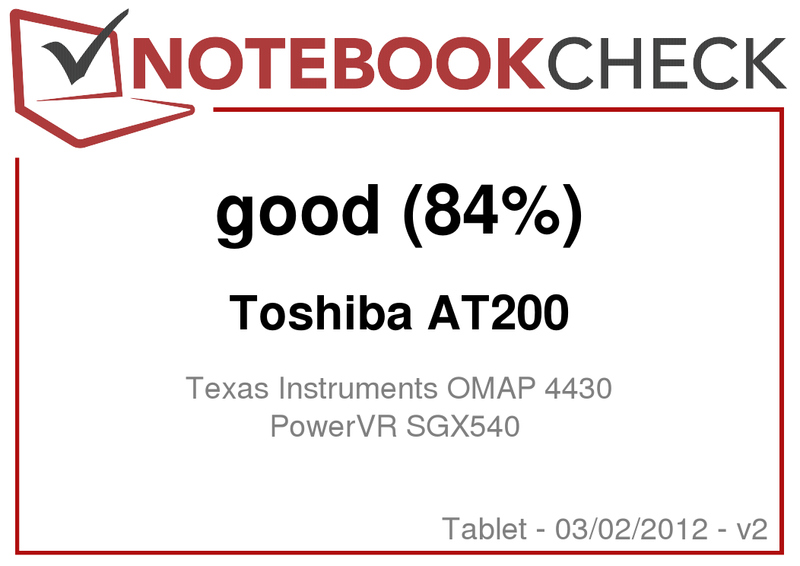 In the widespread Quadrant Standard benchmark the Toshiba AT200 scores 1486 points and is greatly inferior to the Samsung Galaxy Tab 10.1, which reached 2300 points. The AT200's predecessor, the AT100 (ARM A9 with Nvidia Tegra), scored 1523 points in this benchmark. With the help of the GPU benchmark "GLBenchmark 2.1.1", tablets' different graphics can be compared. 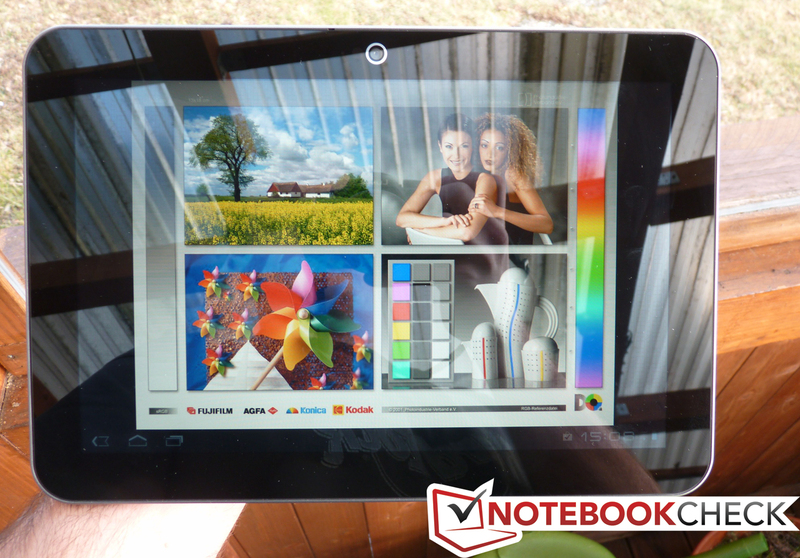 In the "Standard Egypt" test the AT200 reaches 19 FPS, whilst the Asus Transformer TF101 (Tegra 2) runs at 21.9 FPS. 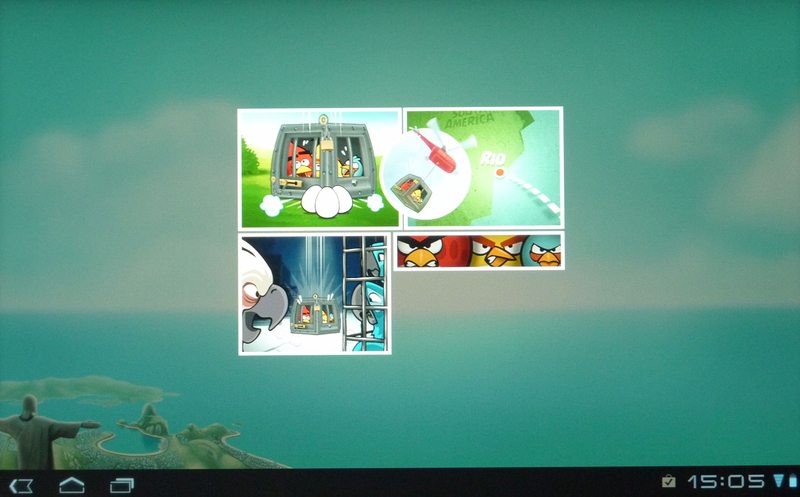 In the comparison with the Asus Transformer Prime TF201 (Tegra 3) the difference is even greater. 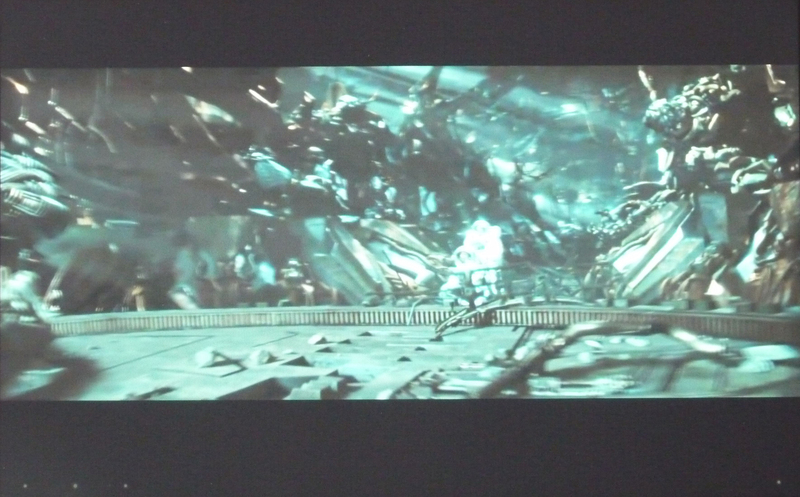 The Transformer Prime runs the test at 40.6 FPS, which equates to 100% more GPU performance. In the benchmarks the tablet comes out with results that are similarly as strong as devices with an Nvidia Tegra 2 processor, yet it cannot compare to the better results of newer Nvidia Tegra 3 systems. 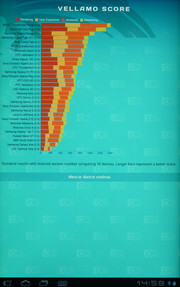 On average the Asus Transformer Prime TF201 scores roughly 30% more points in the benchmarks carried out thanks to its Tegra 3 hardware. Subjectively one has the feeling that the tablet performs somewhat sluggishly and more often takes longer to carry out tasks. The Toshiba AT200 has no problems playing HD material; 720p and 1080p videos are played smoothly. In this area we can't make any complaints. 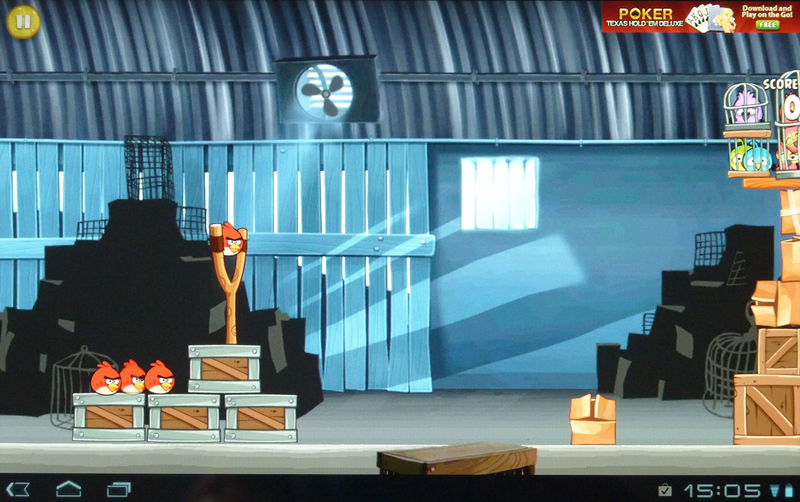 Amidst the extensive gaming library in the Android Market we tested the classics. These of course include Angry Birds, Need for Speed, and Drag Race. The games run smoothly and are a pleasure on the large display. In the system preferences Toshiba has supplied even more features. 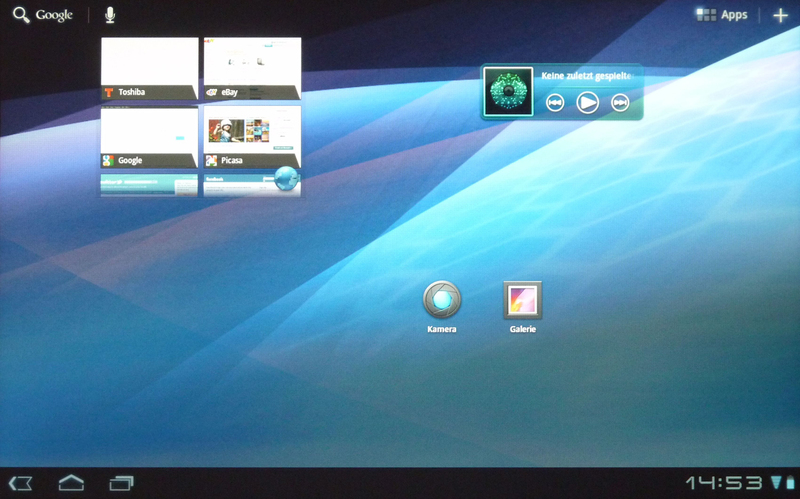 In the multimedia menu you can connect the AT200 to an external display with a higher resolution. In another sub-menu called "Audio – enhancement" there are more settings. 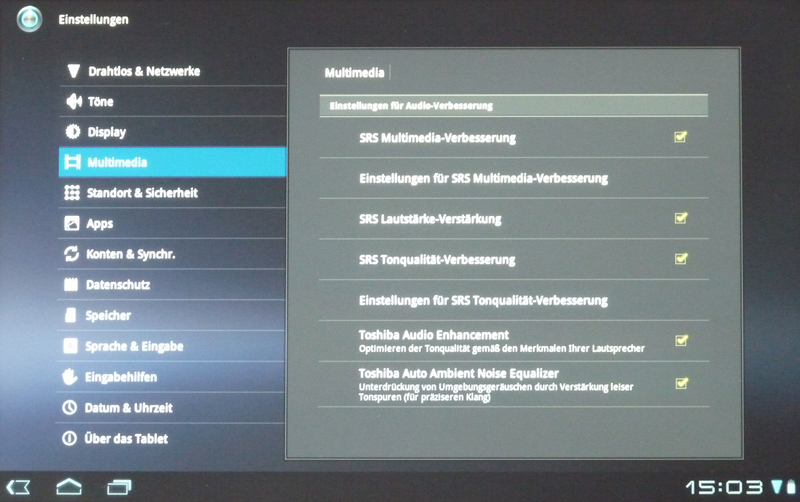 For example the feature "SRS" can be turned on and configured whilst the "Toshiba Auto Ambient Noise Equalizer" should supply a more precise sound, where ambient noise is suppressed by strengthened quiet notes. The effects both of these features have on audio playback will be looked at more closely in the 'Emissions' paragraph. There are preinstalled apps on many tablets, as well as on the AT200. The office suite "Thinkfree Office Mobile" allows the user to create different types of documents and to prepare and look at spreadsheets and presentations. Instead of the official eBay app, Toshiba provides the tablet with a menu shortcut. 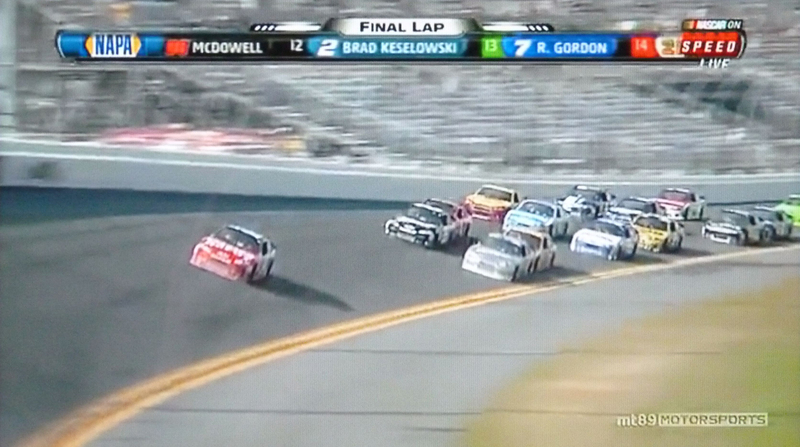 When you press the shortcut, the browser opens eBay's mobile webpage. 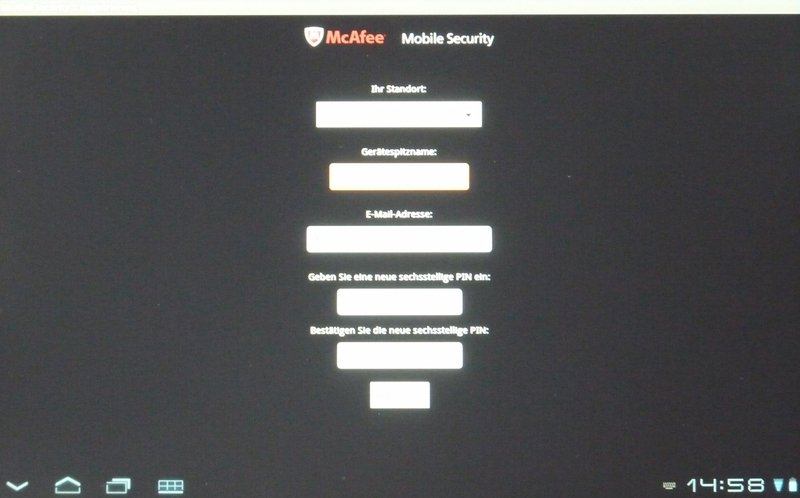 Toshiba gets McAfee on board with its MobileSecurity app and when running the app for the first time there's a prompt for registration. 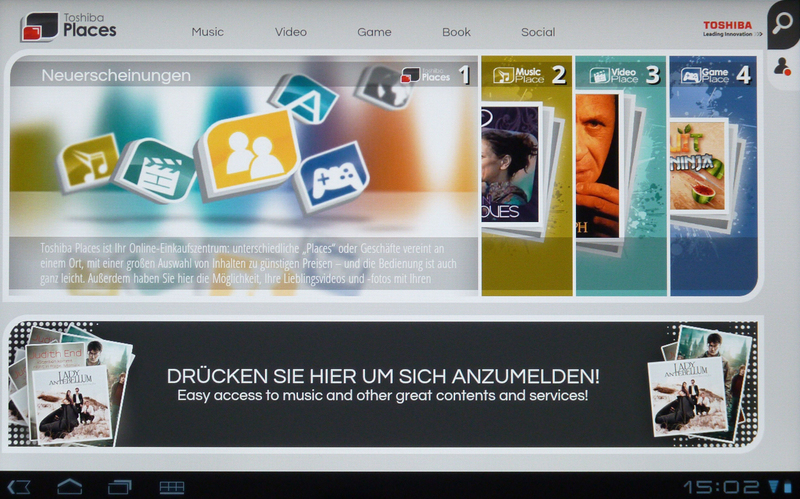 Other preinstalled apps include "Service Station" and "Toshiba Places", programmed by Toshiba. "Service Station" obviously serves as a hub for new updates. This leads us to ask why the built-in system update service offered by Android isn't used. Unfortunately we can't comment further on "Toshiba Places" as the app often force-closed after opening it. As is the norm for tablets and smartphones, there are no moving/mechanical parts (apart from the vibration module). The cooling is passive, which makes the device silent at all times. In our temperature measurements with Voltcraft IR-360 the device doesn't reach any more than 29.0°C in any area. This result confirms the opinion that you get from working with the device. (+) The average temperature for the upper side under maximal load is 23.3 °C / 74 F, compared to the average of 30.7 °C / 87 F for the devices in the class Tablet. (+) The maximum temperature on the upper side is 27.7 °C / 82 F, compared to the average of 34.8 °C / 95 F, ranging from 22.2 to 51.8 °C for the class Tablet. (+) In idle usage, the average temperature for the upper side is 20 °C / 68 F, compared to the device average of 30.7 °C / 87 F.
The speaker is found towards the bottom left of the tablet, embedded in the side framing and on first glance it doesn't catch your eye. The manufacturer states that there are two speakers each performing at 1.5 Watt, yet we could only find one of them. The sound can be heard at lower volumes, yet with these components you shouldn't expect any miracles and instead opt for headphones. At a moderate volume the sound is still okay, yet at higher levels, sound becomes tinny and slightly distorted. The loudspeaker is also far from reproducing satisfactory bass notes. When the additional audio features are turned on you have an equalizer at your disposal and you can change individual settings. Toshiba Audio Enhancement and Toshiba Auto Ambient Noise Equalizer made the sound clearer and nicer. When the different features are individually turned off you start to miss them, as the sound quality really is improved with them. However, best results are achieved with the help of external devices like our AKG K390 In-Ear headphones, where the sound is clean and precise at all volumes, whilst they provide an excellent range of bass notes. In our measurements with the voltmeter, the battery was fully charged. When idle between 2.5 and 4.3 Watt are consumed, depending on whether the display is set to the highest or lowest brightness setting and whether WLAN is on or off. Under load, when playing a video, the tablet reaches a maximum energy consumption of 6.3 Watt, just like the Motorola Xoom. When the device is completely switched off we measured a very small amount of energy consumption of 0.1 Watt. We saw this on the Transformer Prime, too. When put on standby, the AT200 actually consumes 2.3 Watt. This last result is very close to the measured energy consumption value when idle at low brightness. With a fully-charged battery the tablet lasted 14 hours and 30 minutes until it shut down. The display was on and at the lowest brightness setting during the test, and the tablet was in flight mode. No input or other interactions were carried out. In the subsequent loading process from 0% 100% the display was off, all radio communications were on and there were no inputs made. This process lasted 4 hours and 20 minutes until the battery was full. In another battery life test all radio communications were turned on, the display was kept on and at the highest brightness setting and the Android app "Stability Test" brought about a simulated full-load scenario on the tablet. After 5 hours and 30 minutes the device turned itself off. This is a respectable result under full load; comparatively the Samsung Galaxy Note only hung on for 3 hours and 4 minutes in the same test. 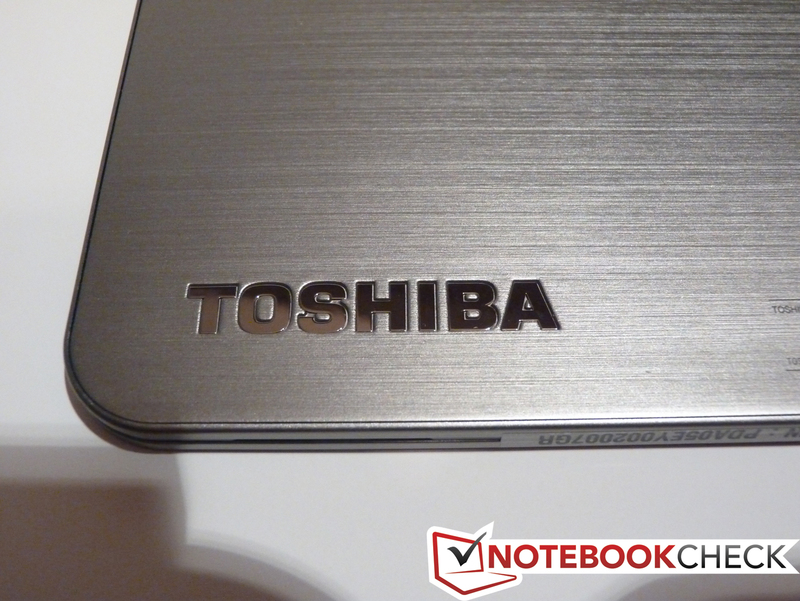 The Toshiba AT100 only reached 4 hours and 15 minutes in this test with its Nvidia Tegra 2. A mixture of surfing the web and watching video clips saw the AT200 last for 10 hours and 14 minutes (at a display brightness level of around 150cd/m²). The Blackberry Playbook only ran for just under 7 hours under similar use. Due to its near-record "thinness", the tablet is a somewhat wider and longer competitive device, which makes using the tablet with your thumbs on the virtual keyboard slightly hard, but this problem is basically present in horizontal mode on any 10.1-inch tablet. For example, its predecessor (AT100) was almost twice as thick as its "big brother". The AT200 is a well-balanced tablet with minor subjective weaknesses in performance, yet it has a very good battery life. The successor to the Toshiba AT100 doesn't have Nvidia hardware and instead takes a different path. 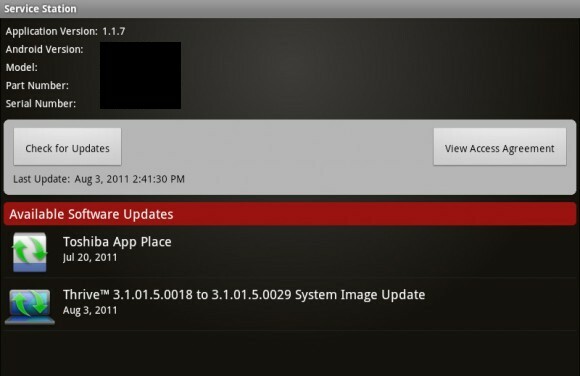 We are yet to hear about an update to Ice Cream Sandwich (ICS 4.0) in the form of an announcement on Toshiba's webpage; it would surely be preferable for the AT200 in times where most manufacturers are already working on releasing ICS. Connecting the tablet to a Windows 7 PC unfortunately wasn't possible due to missing drivers. Here, too, Toshiba should quickly sort this out. The price of just under 500 Euro for the 16GB entry-level version is somewhat too high in light of the preceding review. In this domain the device is competing directly with the top-selling Apple iPad 2. The AT200 has impressive dimensions and has a respectable battery life. Unfortunately Toshiba still hasn't managed to make a Windows 7 64-bit driver. Countless current tablets in the same size format: Apple iPad 2, Asus Transformer Prime TF201, Samsung Galaxy Tab 10.1, Motorola Xoom 2,... and many more.